Pre-sale warmup time draws trainers who will lead their consigned horses in to the sale ring. Everyone hopes for good behavior and high bids. This 2011 Palomino gelding, Young Spark, was just the second entry in the ring. He predicted a successful sale when his price hit $7,700. 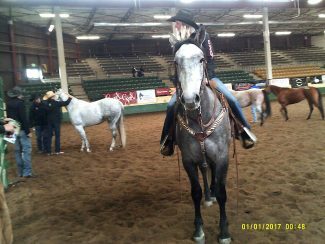 The crowd was massive, the horses outstanding at Colorado State University's 13th Annual Legends of Ranching Performance Horse Sale. Even the sloppy weather at the April 21 event at B.W. Pickett Equine Center didn't dampen bidders' enthusiasm for the 60 consigned horses. Beginning on April 14, LOR began with its Wagonhound Student Competition. 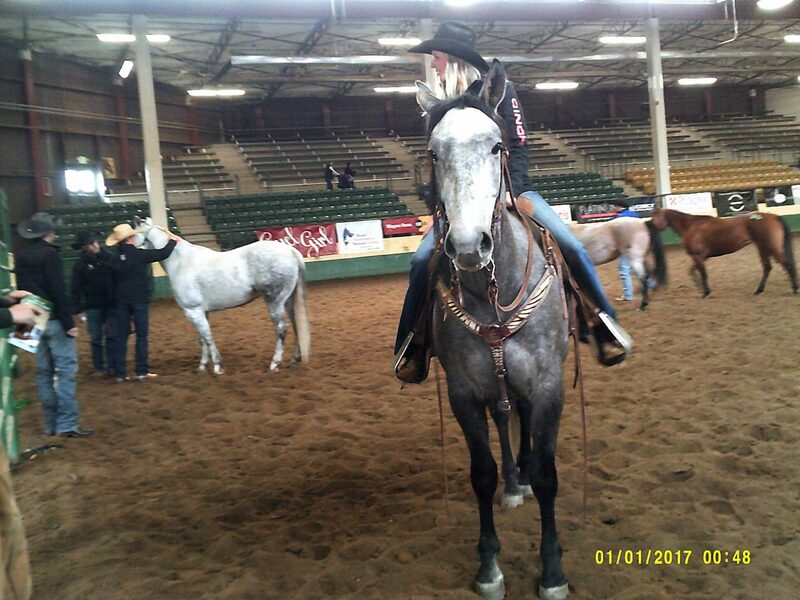 CSU students and assigned young horses vied in riding and in-hand classes for $10,000 in scholarship money donated by CINCH Jeans. 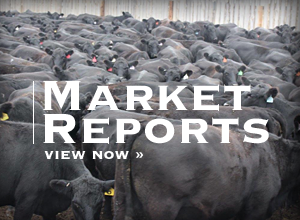 On April 20, it was the Futurity and Maturity show that drew expectant crowds. In just its third year, this part of the program features only horses that have previously sold through the CSU LOR sale. 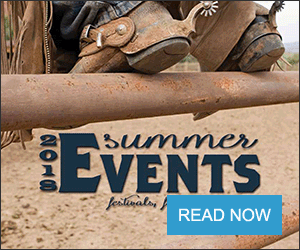 With $10,000 of added money and 30 percent of entry fees paid back to overall winners, the show presents an opportunity for buyers to win back part or all of their horse's initial purchase price. 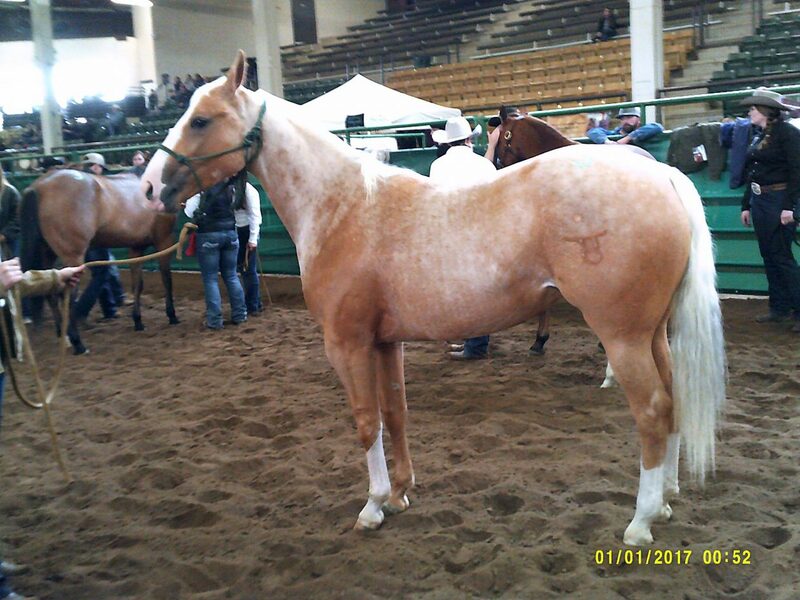 Horses sold in the 2018 sale will be eligible for the 2019 LOR Futurity and Maturity Show. 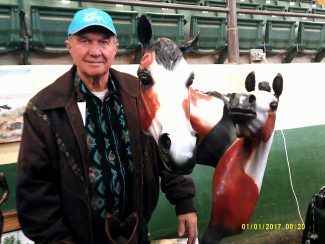 While trainers warmed up their horses, vendors whose booths encircled the indoor facility presented equine-themed merchandise, services and information. One such space displayed Western bronze art pieces sculpted by the late Dawn Weimer, who passed away on Feb. 20, 2017. A prolific, world-renowned artist, Weimer managed to create 130 unique pieces in just 15 years of work. Her husband, Tom Weimer, now continues to have Dawn's incredible items cast for sale to aficionados. There are 49 publicly installed Weimer sculptures in the U.S. In the works just in Colorado are 118 additional monuments/life-size pieces. Prior to the actual sale, consignors and trainers gathered here and there around Pickett Arena to buff and polish or warm-up their horses, many just 2- and 3-year-olds. The youngest have only been saddle-trained a short time, so these youngsters needed as much exposure as possible to the hustle and bustle of public events. But to 4-year-old Van's Foxy Too, this plethora of people stuff was old hat. 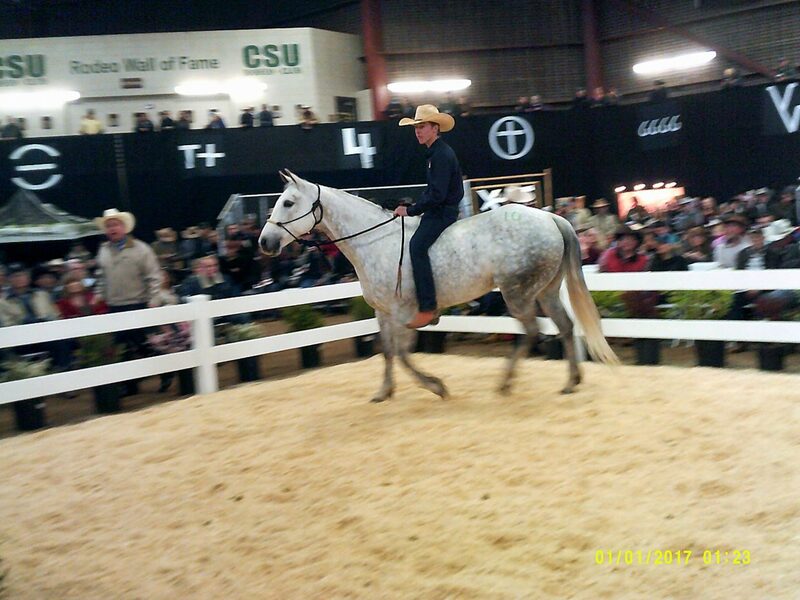 Kim Rounds, an LOR guest consignor, bought the steel grey gelding as a long yearling. She and Logan Stetson co-own Shining KL Partners facility, which offers equine sales, marketing and training in Longmont, Colo.
Rounds said that eager CSU students train about 50 percent of all the young (under age 4) LOR program horses. 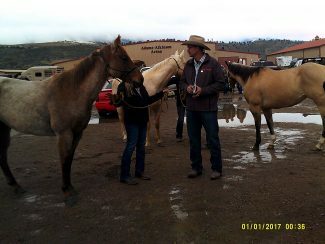 Each works with their assigned animal from August until the following April show/sale event; a percentage of sale profits goes back into the program, the balance to consignors. 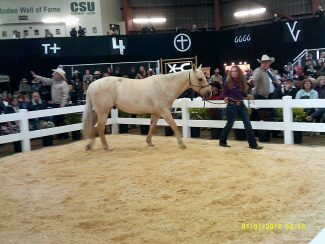 Although this was Rounds' first time as a consignor, it's her sixth year at the sale, at which she previously participated in as a CSU student and teaching assistant. 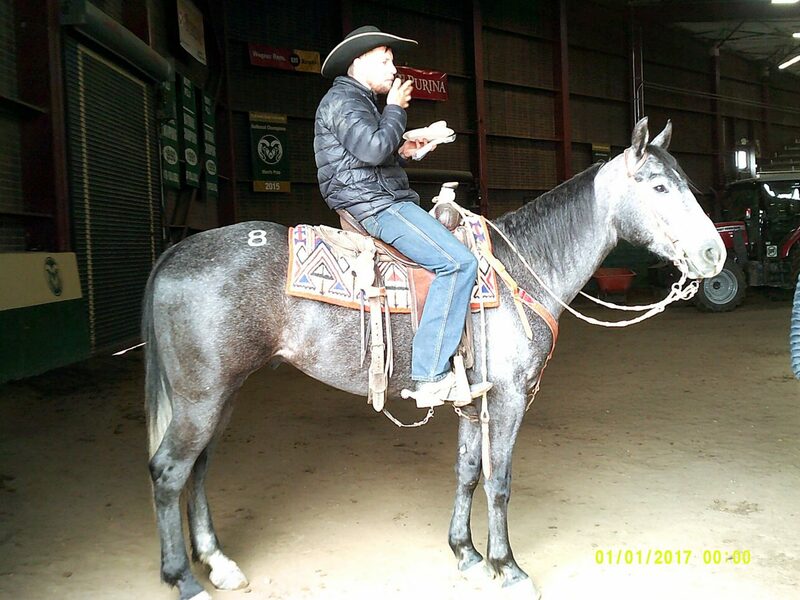 Stetson, a well-experienced trainer, was so confident in his mount's abilities and temperament that the cowboy dropped his reins and leisurely leaned back in the saddle to enjoy a well-earned lunch. Other humans scurried about, attending to last-minute preparations. 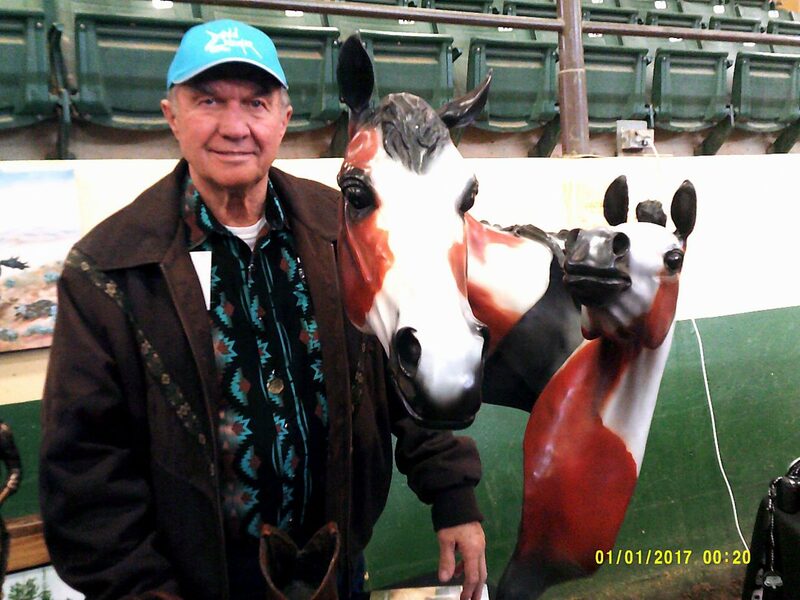 In the mix was Gary Hall, owner of Iron Springs Ranch located near La Junta, Colo. The ranch is a division of Hall Ranches, homesteaded in the early 1900s and currently run by the fourth generation of Halls. Iron Springs Ranch raises American Quarter Horses and runs cow/calf pairs year round on the 40,000-acre property. Given that background and his daily nose-to-the-grindstone labors, Hall is definitely not a rhinestone cowboy. His handsome, eye-catching Olathe boots, however, are another matter indeed. Their diamond-decorated uppers lent an added touch of class even though subjected to the same outdoor water hazards as were other folks' less-impressive footwear. 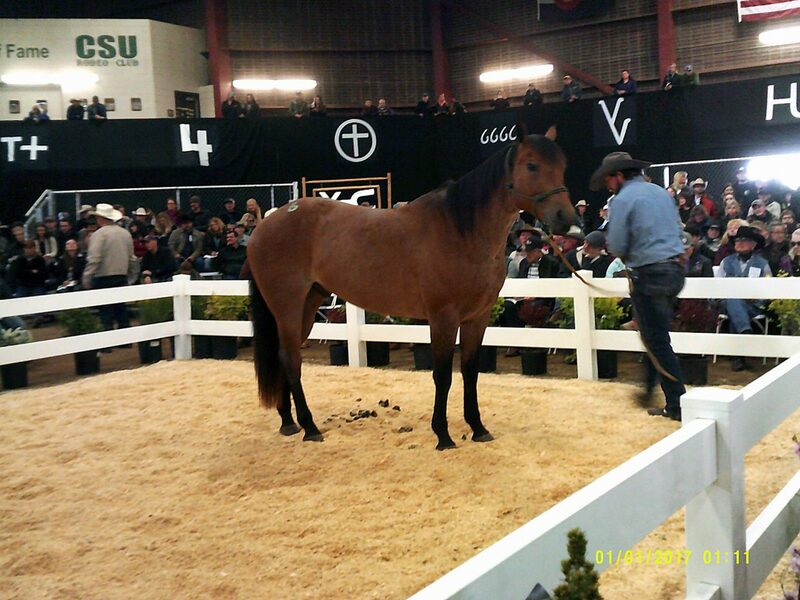 It takes a large, well-organized team to present such a fantastic group of horses to the buying public. These dedicated folks include CSU student trainers and volunteers; sponsors; by invitation-only rancher consignors and trainers; Equine Sciences advisory committee; sales staff; and more. In and around the sale ring, auctioneer Justin Holmberg called for bids which Stacy Lee, Justin Morris, Buck Waite, and guest Daniel Miller vigilantly spotted. Announcer Spence Kidney kept everyone appraised of the event's chronology. Prospective buyers bid in-person or by phone. The sale itself began promptly at 1 p.m. Bids flew fast and furiously… but friendly. Everyone recognized this not only as an opportunity to acquire a potential top-notch youngster or seasoned performance horse, but also as a way to contribute to the continuity of the valuable LOR program. Winning bids for the talented, young equine prospects ranged from $2,500- $17,000. One stunning horse especially stood out. 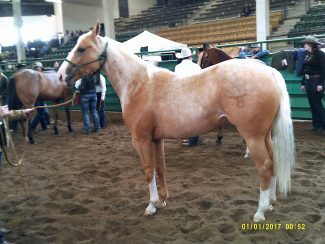 Although not a top-seller, Cee Hickory Mr, consigned by Iron Springs Ranch, is a 17-year-old gelding who nevertheless fetched an impressive $6,200. Wise bidders, rather than arching eyebrows at his advancing age, respected the sorrel show horse's bovine-savvy athletic abilities. Living up to his barn name, "Handy" is a finished head horse or cutter, a money-earner that also assists on the ranch as a finished working cow horse. Two of the sale's lot numbers were reserved not for horses but for two donated getaway packages. Bidders verbally jostled for the win but graciously celebrated whether or not they came out on top. C Lazy U Ranch donated a two-night stay for two Winter Escape package that brought $1,500. The lucky winner and guest will enjoy upscale lodging and gourmet meals, riding, hiking, fishing, archery, cross-country skiing, ice skating, tubing, snow shoeing, sledding, outdoor hot tub, exercise equipment, evening entertainment and other seasonal activities in a lovely Colorado setting. All proceeds benefit student activities associated with the LOR program. The Professional Rodeo Cowboys Association provided a Wrangler National Finals Rodeo package worth a fair market value of $800. Two extremely generous gentlemen engaged in affable arm-waving combat until the auctioneer's encouragement eventually garnered $3,000 for the two-night Las Vegas "yee-ha" stay. One very victorious cowboy went home dreaming of his upcoming getaway for two that included rodeo tickets, spa treatment, stay at the South Point Hotel, Silverado Steakhouse feast and more. The crowd applauded the full $3,000 winning bid that the LOR program would receive.